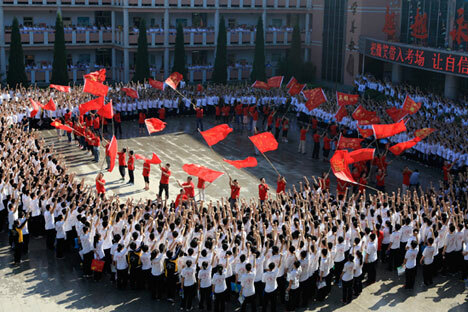 Students cheer as teachers wave flags before the students take their national college entrance exam in Hengshui, Hebei province, June 7, 2014. Andrei Sidenko, who was awarded the Teacher of the Year prize in 2013, attempts to compare the Russian university entrance exam with its analogues in the United States (SAT), the United Kingdom (A-level) and China (Gaokao). 1. The main thing that Russia’s Unified State Exam (EGE), SAT, A-level and Gaokao have in common is that they are all university entrance exams and are held in the spring or summer. 2. While the results of A-level, Gaokao and EGE are sufficient for being accepted to university, SAT scores account for only 25 percent of university application criteria. Universities in the United States also take into account, the high school GPA (grade point average), co-curricular and extra-curricular activities, and evaluate student essyas and recommendation letters. 3. A-level, Gaokao and EGE are mandatory for all students. SAT is only for those high school graduates who wish to enroll in a university. 4. SAT’s Math Section is easy enough, unlike the section, where the knowledge of English (grammar and reading) is checked. SAT also has tests for individual subjects to choose from; the student must choose three out of four. Since 2015, EGE ‘s mathematics section is divided into two parts – a base section and a profile section. Those graduates who do not need mathematics for admission to university must pass only the base part; those who need it should take a profile exam, which is much more difficult. A-level and the Gaokao have no such divisions. 5. The most difficult conditions for exams are in China. Like with the EGE, the entrances to exam halls have metal detectors, and, like Russian students, Chinese high-school graduates are prohibited from using any gadgets. In China, cheating leads to a life ban from a repeated examination, which does not exist in Russia. The question papers for the Gaokao are delivered by police officers, while in Russia it is done by special communication officers. The conditions of SAT or A-level, where there are no such strict arrangements, are more relaxed. 6. SAT is three hours and 45 minutes long; A-level test takes from 1 hour to 1.5 hours, depending on the exam; Gaokao is of 2 hours for mandatory subjects and 1.5 hours for additional disciplines; EGE must be completed in between 3 and 4 hours. 7. Another distinctive feature of SAT is that it is a paid procedure for all those wishing to go to university. The cost is $45 if the test is held in the United States, and $75 if outside. EGE, A-level and Gaokao are free of charge. Andrei Sidenko is one of the world's 10 most influential teachers, according to the US teacher community Connect Learning Today.